As a boy growing up in India, there was no greater pleasure than attending, sometimes sneaking, into Bollywood movies whenever possible. The magic of the movies was very real for young man, and in his adulthood, that magic never waned. A move to the United States and a ceaseless work ethic led to numerous business successes, and when it was time for Jay, the client, to build his own home theater, he knew exactly what he wanted. Only a true cinematic experience, with all the grandeur and impact he experienced as a boy, leaving the audience in wide-eyed wonder, would do. 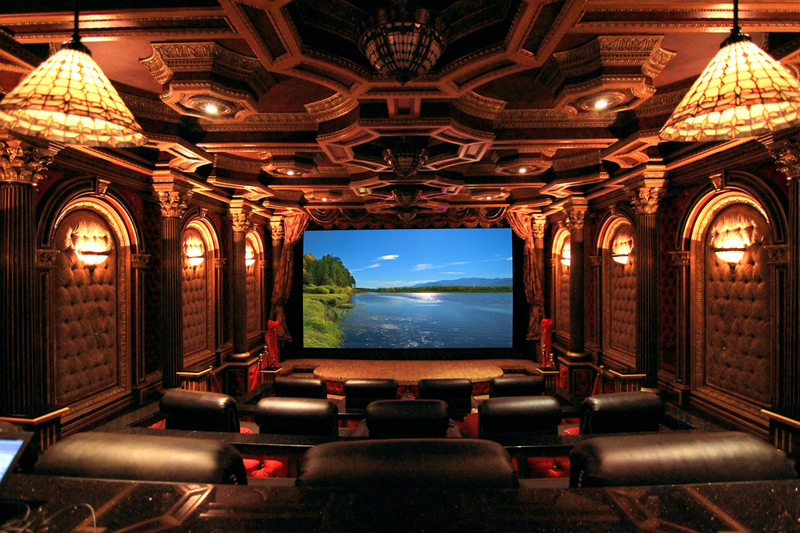 As hinted above, the client-named Dreamland Theater is no ordinary home theater. The custom home was built eight years ago on a hill that allows for views of the Manhattan skyline. Both Ram Ragulan, owner of Astrum Group and lead integrator, and Robert So, the home’s lead designer, knew the theater was going to be a critical element. With that in mind, special considerations were taken from the outset in order to realize Jay’s vision. For instance, contractors dug 15’ into the rock base of the hill to ensure the theater had enough height to contain stadium-style seating. This depth also made possible a massive 16’ VisionX cinematic screen by Vutec with horizontal masking. Talk about immersive! With the screen and seating sorted, a truly special projector was needed to deliver the cinematic experience. Working directly with Jeff Schneider, Digital Projection International’s (DPI) northeast regional sales manager, Ragulan and Jay chose DPI’s newly-launched TITAN 1080p LED projector. 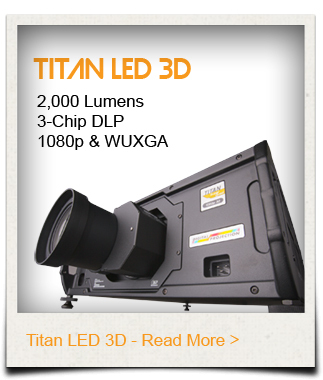 Boasting the highest lumen output of any purely LED-driven projector available, the TITAN LED delivers an incomparable color gamut alongside solid-state reliability. Furthermore, the owner wanted a projector that he could use unconditionally, at all times, and didn’t want to be concerned about lamp hours, lumen maintenance, or consumables. By delivering consistent imagery for over 20,000 hours, all without using a single lamp, the TITAN LED powerhouse was undoubtedly the best solution for this grand cinema.